Apparently John Gruber will link back to just about anyone who links to him. I’ve been working on an ongoing translation project for the past four months. It’s being released in the USA under the title Unbeatable Banzuke on the G4 cable station. The show was called 筋肉番付 (kinniku banzuke—”Muscle Ranking”) in Japanese, and aired about ten years ago. Yesterday, I caught just a few minutes of a segment I had translated. From what little I saw, the production company hasn’t tampered much with my translation (as edited by my editor at the translation agency). The American version is kind of weird. They’ve got an American doing completely new voiceover, and his pronunciation of Japanese words is as bad as anyone who doesn’t know a lick of Japanese. The show closes with more completely new content in the form of a signoff by a Japanese-speaking announcer named Kei Kato, who was not a part of the original show. I’m not exactly sure what the point of this extra “local color” is. I’m also a little puzzled that they’d want the local color, but stick with such stridently Americanized pronunciation for Japanese words. They also seem to have deleted all the original telops, including the many advertising the prize money for each event. This is reasonable, but since the contestants frequently make reference to the money they stand to win, I’m guessing they’ve probably edited those parts out. I’ll need to watch more to find out. 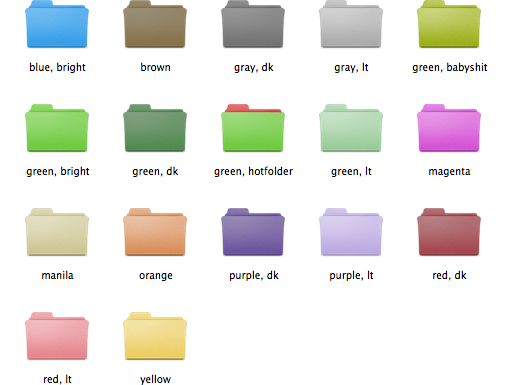 I’ve created some colorized folder icons derived from the generic OS X folder icon. You can get them here. This juxtaposition all by itself was entertaining enough, but when they got to the part about people who actually do use tapeworms as a weight-loss tool, I was agog. Reality outpaces our ability to satirize it. Gwen and I saw something about lap-band surgery on TV recently, and I was struck by an idea. Instead of gastric-bypass, lap-band, stomach-stapling, and other forms of bariatric surgery, which are both risky and prone to complications, doctors should introduce therapeutic tapeworms. I dedicate this idea to the public domain, in the hopes that someone will take it and run with it. I can’t believe nobody’s thought of this before. When Gwen and I bought our current house, we inherited a letterpress, vintage approximately 1920, that the previous owners could not take with them when they moved to Spain. Gwen was interested in learning how to use it, but knowing how the best-laid plans of mice and men can go, we agreed that if she hadn’t done anything with it in nine months, we’d get rid of it. That got Gwen thinking. She designed a series of cards, got plates burned, bought paper and ink, and got to work. I watched. It’s fascinating to contemplate letterpress printing. It’s a very fussy process. These days if we want a hard copy (a phrase that suggests how a paper instantiation of information is secondary to the platonic electronic form), we hit command-P and a few seconds later, a page (or many pages) pops out of the printer, perfectly rendered. It’s a little different with letterpress printing. Assuming you bypass the laborious process of composing type and have a plate burned, you still need to affix the plate in your chase, estimate the correct amount of packing on your platen, estimate your gauge-pin positions, and print some “make-ready” to home in on the correct packing and pin positioning. Once you’re getting a uniform, square impression—a process that can easily take an hour—you can start printing. The packing (extra sheets of paper underneath your printed piece) determine how hard the plate’s impression is, and a single piece of tissue paper in the packing can make an obvious difference in print quality. And if you’re doing a two- or three-color job, you need to do all this repeatedly—and get your registration straight with the previous print passes. The whole process can go wrong in numerous ways, and our eyes are highly attuned to even subtle errors in printed matter. A piece that’s rotated so that a printed line that goes out of parallel with the edge of the card by just 1/30″ over a length of 5″ is an obvious reject. And while we generally don’t think of printing as physically dangerous, with a letterpress, it can be. Because the equipment is, at root, a press. And it weighs about 1800 lb, running off a large flywheel carrying a lot of momentum. If your hand happens to get in the way when platen and plate are pressed together, you’re going to have a very flat hand. 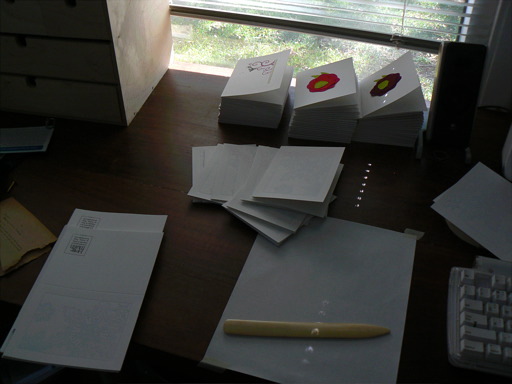 In spite of the hard work, the finickiness, and the risk of grievous bodily harm, Gwen has produced a line of cards. They’re being sold at Book People, and will be sold on the East Austin Studio Tour and Cherrywood Art Fair. Oh, and she has a website of course. Horsemuffin. Apparently they’re the cause of mistakes. Shoot, I could have told them that. While visiting Chicago recently, I borrowed the book The Devil and the White City, a book about the Columbian Exposition of 1893, and a serial murderer who stalked Chicago at the same time, H. H. Holmes. Even growing up the better part of a century after the fair ended, as a Chicagoan it was always part of the collective unconsciousness, and fair factoids were part of my knowledge of the city’s history. But the book brought a lot of the small details and broader themes into clear relief for me. Some of those themes got me thinking that, at least in some ways, Burning Man carries on the principles the Columbian Exposition. The World’s Fair of 1893 was conceived partly as a temporary utopian city, partly as a grand spectacle of the exotic, the titillating, and the audacious. All of these things, at least in the abstract, are true for Burning Man. At the World’s Fair, the utopianism was material: it was called the White City partly because all the major architecture was that color, and partly because, unlike regular cities (Chicago at the time was described as “a gigantic peepshow of utter horror.”), it was very clean and manicured. It had pure drinking water and effective sewage. It was extensively wired for electricity, with hundreds of thousands of bulbs being lit—for some visitors, it was their first exposure to electric lighting. None of these things strike modern city-dwellers as miraculous, and indeed, it is perhaps partly the fair’s legacy that we can take them for granted. Accordingly, the utopianism that Burning Man represents is intangible: the gift economy, self-expression, volunteerism, and community-building. Indeed, at the material level, Burning Man is a harsh place demanding “radical self-reliance” that reminds participants not to take their everyday material comforts for granted. The World’s Fair had numerous spectacles. It would be hard to top the Ferris Wheel, which was invented for the Fair. That first one was a doozy—each carriage was the size of a train car accommodating 60 riders, and there were 36 cars. The whole thing reached a height of 250′, probably a higher altitude than any of the visitors had experienced without having a hill underneath them. The Midway of the fair (which has given its name to a part of every carnival since) introduced Americans to exotic foods and peoples from other countries. And for titillation, it was the occasion for the arrival of belly-dancing in this country. Burning Man has its share of the epic, the exotic, the marvelous, and the titillating as well. White-flesh nectarines are the latest addition to my list of favorite things.